Going back to Belize had been on my mind for years- over 25 years actually. Some of the best times of my life were spent exploring the gorgeous waters and tiny islands off the coast of this small, English speaking country in Central America. I went there as a young traveler and bought a small sailboat with a fishing well with my sister when I was in my early twenties. We had some adventures (OMG!!!) and we lived to talk about them, thanks to the gods that look out for first time sailors. 10 years later, in the 80s, with a lot more experience and expertise, I sailed back there on a big ketch and ran charters there, picking my way around the reef strewn waters, and visiting the off shore coral atolls and some of the world’s most beautiful sailing grounds. 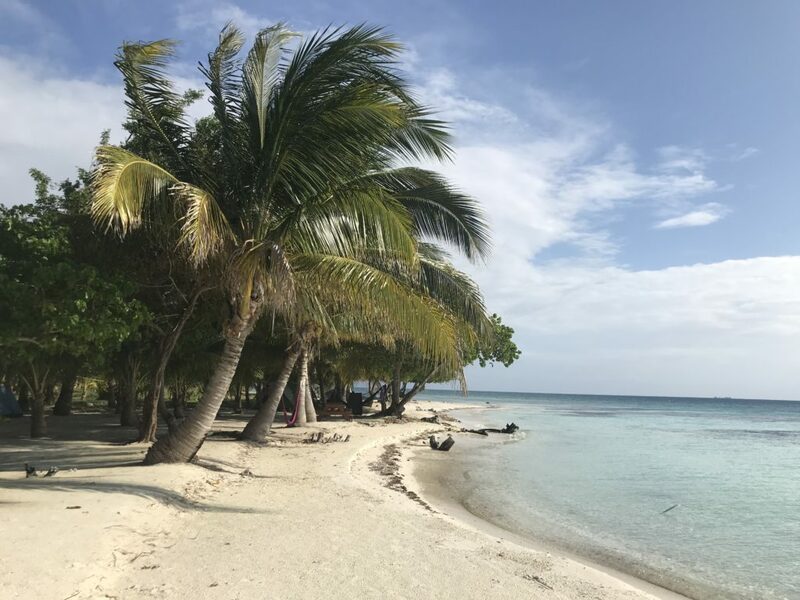 It wasn’t until my partner Spring agreed that we should do a women’s kayak trip somewhere warm and tropical and made plans to go to Belize to reconnoiter that the thought of going back moved from fantasy to possibility. Thank you Spring! Plenty of people seemed to love the idea as our trip filled up in a hot minute as soon as we posted the barebones outline of what we hoped to do. 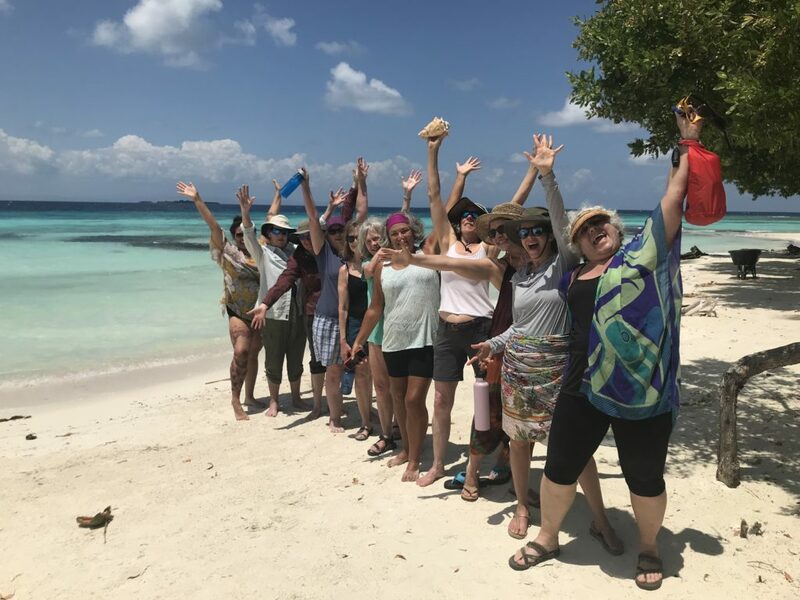 What followed was an incredible mixture of wonderful women, beautiful water, wild deviation from our original plans, lots of learning, and some outright miracles. 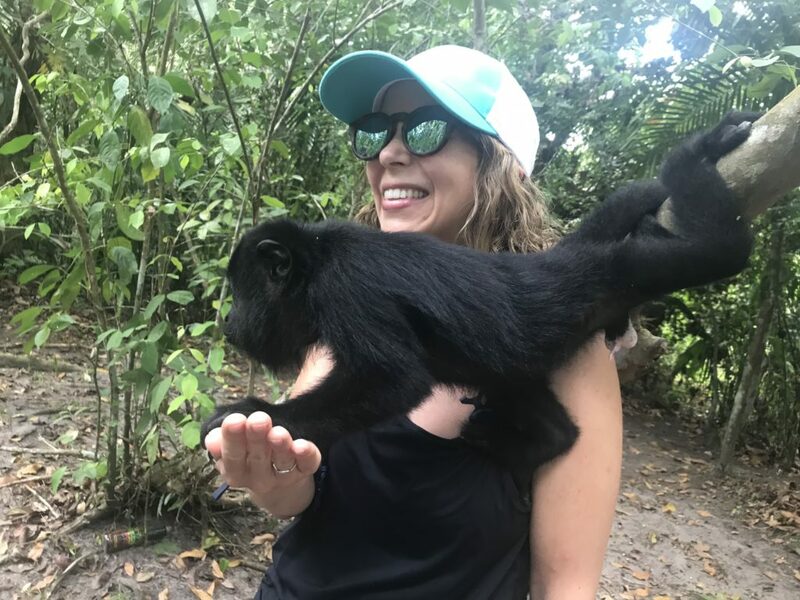 Journey For Purpose’s Women’s Kayak Trip to Belize was a big success by any measure. Spring and I are both so grateful that it is possible to make something amazing out of nothing but an idea and a longing. 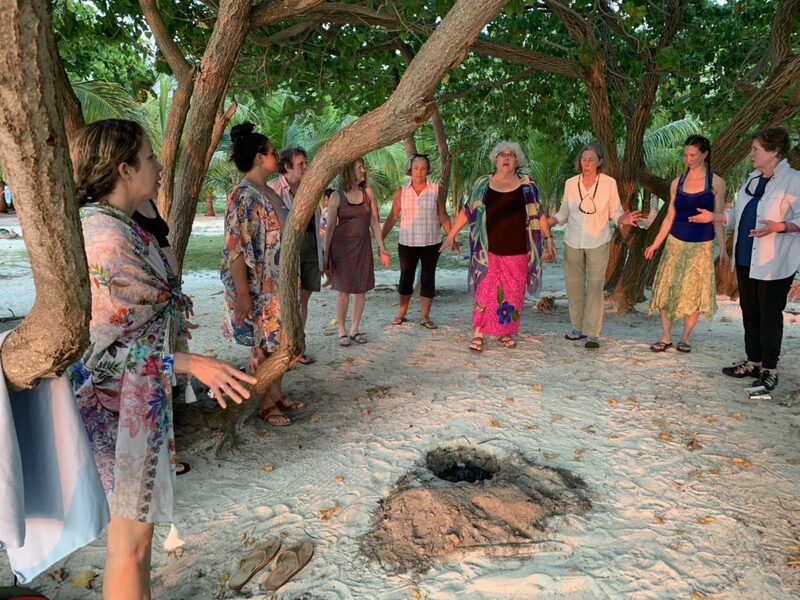 The women who joined us had an empowering experience- it was deeply bonding, incredibly gorgeous, very enriching, and ultimately transformative. Our souls sensed the possibility of freedom and our spirits soared in response. 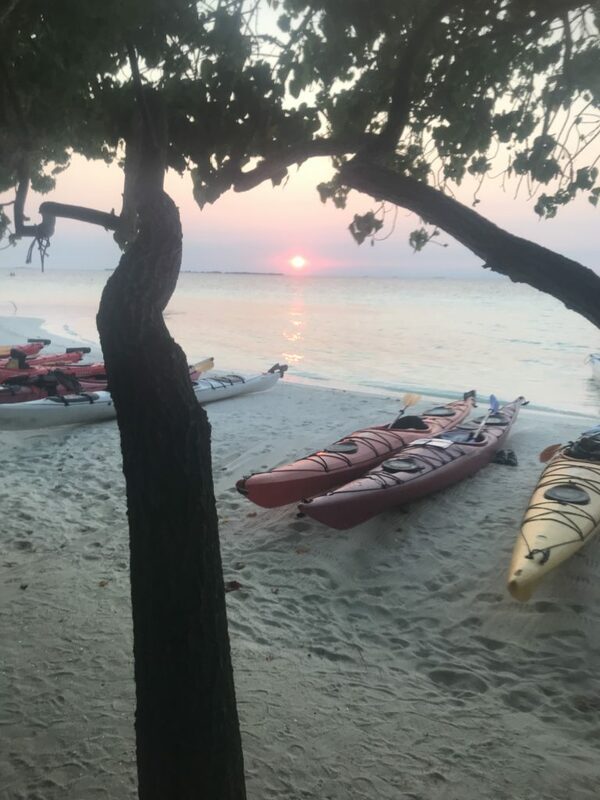 We paddled and camped on a true gem of a tropical island- all the things that you can imagine- coconut palms swaying in the breeze, pelicans dropping into the azure water, white sand so warm on bare feet. We set up a tent village, enjoyed hammocks, picnic tables, incredible snorkeling, and a beautiful beach perfect for yoga, beach art, and sunbathing. Our cook, our guide, and the island caretakers did everything in their power to make us comfortable and we had the most amazing time. We shared stories, we sang songs, we played games, we went off alone, we snorkeled, we read, we sat around a fire, we bonded and deepened and lightened our load until we were all laughing and playing like children. Early on, one woman got the news that her father in law had died, and although he had been very ill, it was unexpected and she felt terrible being away from her family. I told her that whatever she decided to do we would support her and I wondered if we could put on a memorial for him that evening to bring us all together to share her grief and to hold her in understanding and compassion. We had a most beautiful ceremony with smoke from a small fire rising to heaven while the orange sun set into the water beyond a lovely altar created with shells, stones, and beach beauty. We sang, shared readings and stories, and toned while the sun sunk down into the night and everyone was uplifted. She was able to enjoy being with us to complete the voyage and we all were so impressed by what women can do together. Everyone showed up with something to offer and the result was so moving. 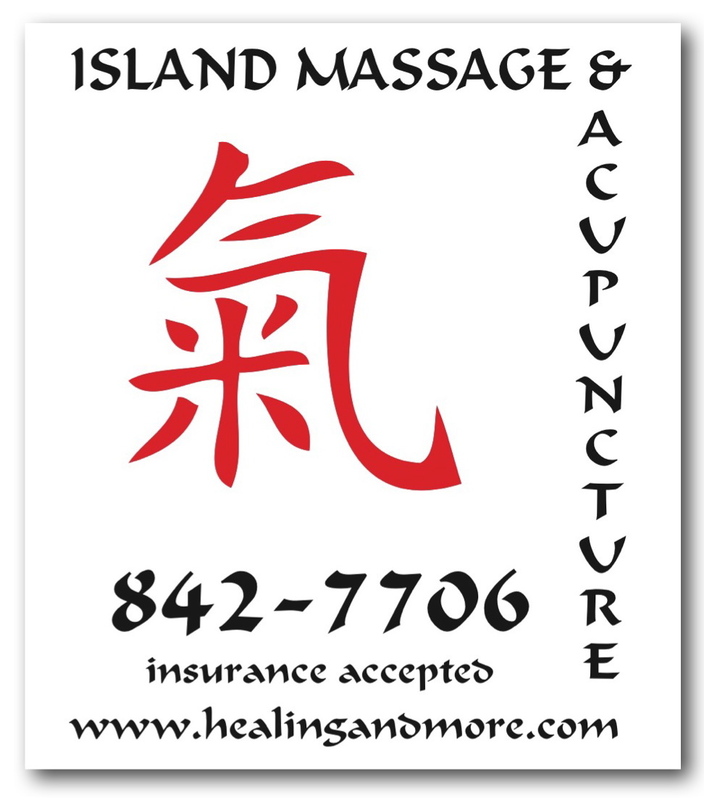 Tears flowed as all grief and ancient losses were touched and offered up for healing. Leaving the island for the mainland, we relished our hot showers and a chance to see a bit more of Belize. Touring the chocolate farm and factory and the baboon sanctuary were wonderful choices for us as a group. Our last evening together was a rich sharing. Being in a different country with so much to see and learn is always deeply stimulating. Enjoying a place so rich in beauty and color, fabulous people, and incredible natural history is a delight. But what will stay with me the most is the experience of being with a group of women who are interested in being their most authentic selves and of exploring what life offers at the limit of their comfort zone, trying something new, signing up for an adventure, and sharing themselves as they open up to new things and the empowerment that brings. I love to watch new possibilities emerge as we support each other in shedding what doesn’t serve us and open up to who we really are and all we have to offer. Hurray for Journey for Purpose- Adventure/Empowerment/Community!! !